What do you think of my new fitted kitchenEinbauküchefitted kitchen? It’s an open-plan kitchenoffene Kücheopen-plan kitchen with an integrated dining areaintegrierter Essbereichintegrated dining area. I often have guests, and I love chatting to them while preparing the food. In the middle of the kitchen, there’s an island with a built-in hob and oven, covered by a hood and to flankflankieren; hier: einfassen, einrahmenflanked by floor-level cupboards with soft-close drawersSchubladen mit Schließdämpfungsoft-close drawers. The top drawers are for cutleryBesteckcutlery, the bottom ones for potKochtopfpots and panPfannepans. Along the wall, there are further cupboards. Those at eye level contain shelfRegalbrettshelves for glasses and crockeryGeschirrcrockery. The tall cupboard in the corner is our pantrySpeisekammerpantry. It has slide-out drawers where we keep dry goodsTrockengutdry goods such as rice, tea and spiceGewürzspices. It’s great to have such a lot of storage spaceLagerraumstorage space. The worktops are made of hard-wearingunempfindlichhard-wearing and easy-to-cleanleicht zu reinigendeasy-to-clean marbleMarmormarble. There’s plenty of room for kitchen appliancesKüchengerätekitchen appliances such as the food processor and the espresso maker. The stainless-steelEdelstahl-stainless-steel sink has two basinBeckenbasins and a pull-outausziehbarpull-out tap. The dishwasher is right next to it. I really enjoy cooking in my new kitchen. You must come over for a meal soon! 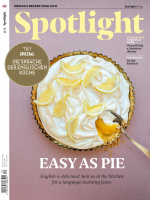 Dieser Beitrag stammt aus dem Spotlight-Magazin 12/2018. Die gesamte Ausgabe können Sie in unserem Shop kaufen. Natürlich gibt es das Magazin auch bequem und günstig im Abo. Kein amerikanischer Präsident hat in der Öffentlichkeit so ausgiebig geflucht wie Donald Trump. Eine kleines Obszönitäten-Kabinett. Die meisten Lerner eignen sich Flüche und Schimpfwörter mit einer ganz besonderen Freude an. Aber Sie sollten mit potentiell anstößiger Sprache im Englischen sehr vorsichtig sein.